The 29-year-old woman was reported to have entered the water at around 3.30am on May 11. Firefighters performed a daring rescue after a woman jumped into the River Lune from Millennium Bridge. 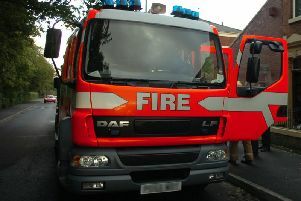 Specially equipped fire crews from Lancaster raced to the scene and pulled the woman from the river, say fire services. A spokesman for the fire service said: "When we arrived the woman was conscious and swimming but was reluctant to leave the water. "We sent three fire fighters into the river wearing water rescue clothing. "Thankfully the tide was out but there was still a lot of water and it was very muddy and cold. "We were at the scene for around 30 mins. The woman was very distressed when she came out of the water." The woman was taken to Royal Lancaster Infirmary by ambulance.